The Eco Friend printable pack comes in PDF format and is one way to plan for and introduce playful active learning opportunities as children begin to develop a respect and understanding for the world around them. Help them to become caring Eco friends and warriors! With a focus on outdoor learning and play the printables can be used for both individual and group experiences. PDF format with editable text boxes. 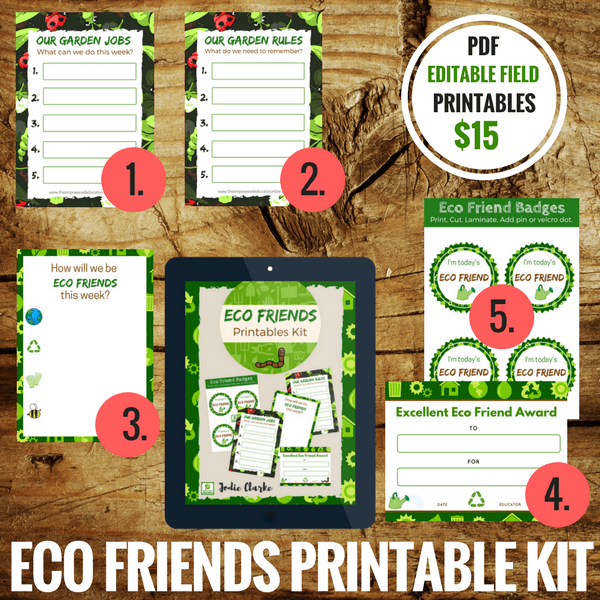 HOW WILL THIS ECO PRINTABLE PACK SUPPORT LEARNING? The Eco Friend printable pack comes in PDF format and is one way to introduce playful active learning opportunities as children begin to develop a respect and understanding for the world around them. Help them to become caring Eco friends and warriors! With a focus on outdoor learning and play the printables can be used for both individual and group experiences. responsibilities that all Eco Friends must participate in. Use to encourage a sense of responsibility, pride and awareness of the need to care for our environment. pets. You can of course add more on another page or use own areas. Eco Friend Certificate – Give to all who take on role of Eco Friend during a week or just choose some children who have done something extra special to look after their world that month. Garden Focus Group Posters – Work together to discuss, research, investigate and agree on simple tasks and rules for looking after and working in the garden. Add new jobs each week and incorporate into your planning as you extend upon the experiences, actions and interests that take place. Rules might include something like We put our gardening tools away in the shed each day – keep it simple. 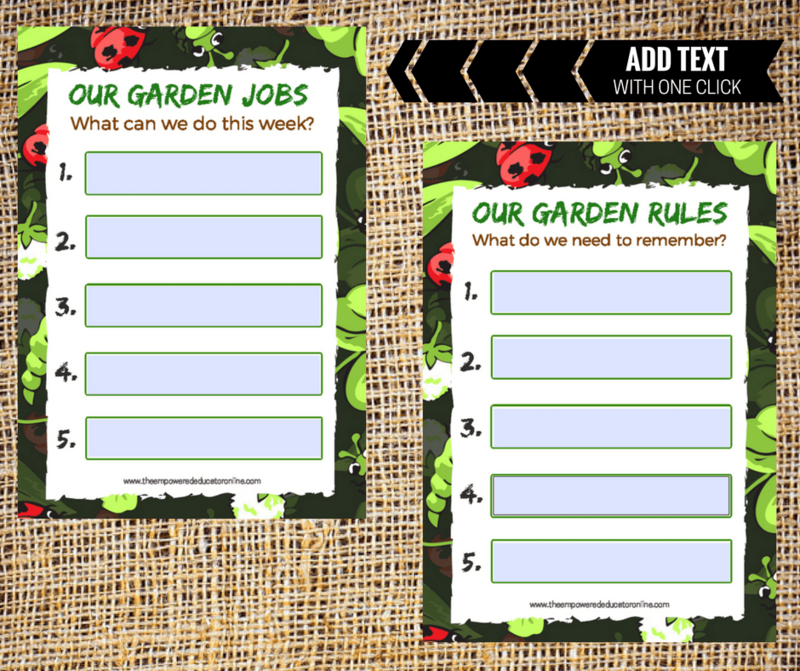 2 x Garden Jobs/Rules A4 posters in PDF format with text fields to type into. 1 x Certificate in PDF format with text fields to edit. 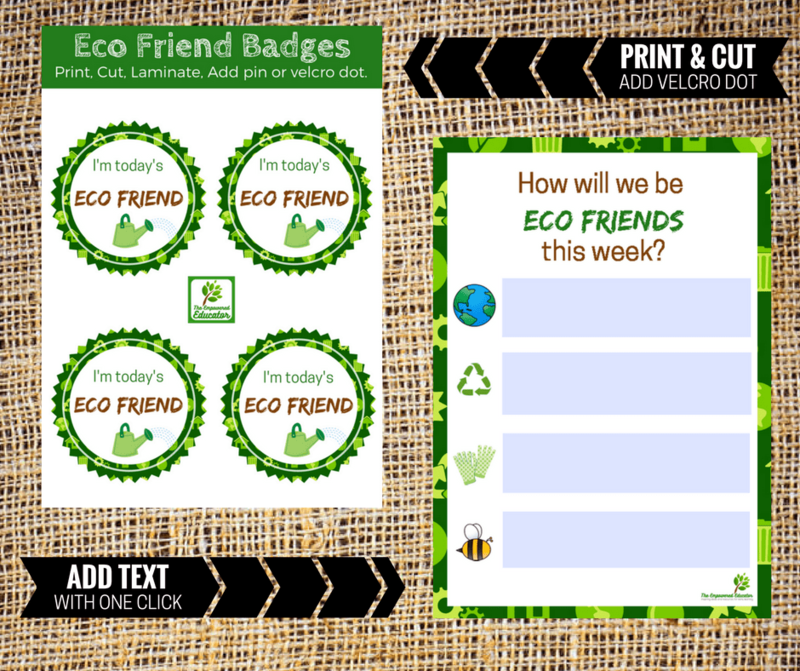 1 x eco friends badges template in PDF format for printing. 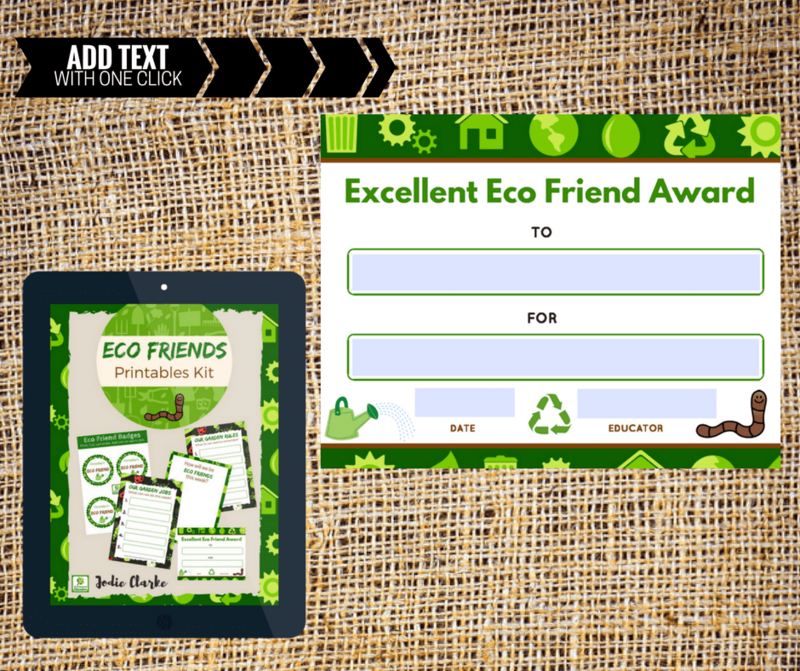 1 x eco friends A4 poster in PDF format with text fields to edit. All the hard work is already done for you, just type into the documents or print and complete with the children. Encourage children to become active participants in their own learning when it comes to sustainability and caring for the world and community around them! Please Note : All files arrive via email immediately after payment – please ensure you enter the correct address at the checkout or contact [email protected] for more help.